A maker of particularly good ergonomic keyboards. I use their DSK (Dvorak Standard Keyboard) — a keyboard layout that is easier than QWERTY on the wrist muscles and gives about 10% faster speed to good typists, considerably better for the less dexterous. My current keyboard is a Kinesis Classic QD (model KB1333PC/QD). I have had it since 1999-11. I am highly pleased with it and would recommend one to anyone. It also comes in standard QWERTY layouts for the less adventurous. It a compact keyboard, only. That leaves more desk space for manuals and papers. 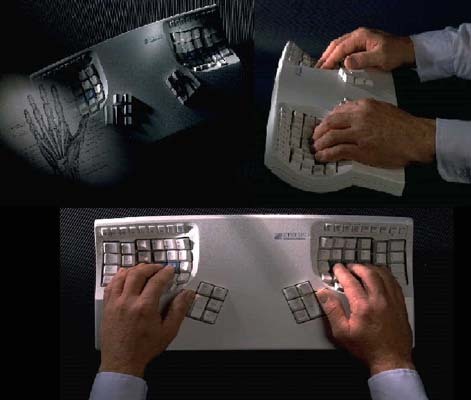 Most keyboards are about 10.16 cm (4 in) wider, yet your arms rest a more natural 17.78 cm (7 in) further apart with the Kinesis. That model is no longer sold, but they have a similar model called the Advantage2 that comes with either Cherry brown, or Cherry red switches. Every once in a while, when it needs a drastic cleaning, it goes on the blink and I panic at the thought of losing it. No other keyboard comes close for speed and comfort. I am actively searching for a replacement, at least until it is repaired. The function keys (and macro programming keys) are failing. I learned DSK on a conventional keyboard, then went through a major adjustment with the Kinesis DSK. Even switching from conventional QWERTY to Kinesis QWERTY would have been quite a leap for me, though others report having not nearly as much trouble as I did adjusting. The keyboard looks very strange, but is instantly comfortable. It looks like two widely separated bowls countersunk with keys arranged in very crooked rows around the inner surfaces of the bowls. Vertically the keys are arranged in straight columns rather than diagonals as is traditional. There is no separate arrow keypad or numeric keypad (though you can buy an optional separate pad and there is an embedded keypad as on a laptop). There is a logical embedded one that I almost never use. The advantage is it makes the keyboard narrower. This means the mouse is closer so you don’t have to reach as far to operate it. It saves shoulder strain. Your palms rest on the keyboard surface and your fingers drop down into the bowls. The crookedness of the layout exactly matches the crookedness of your natural finger position. It looks strange, but it feels perfectly natural. It comes with a very long cord and dual adapters so it will work on any PC (Personal Computer) . In addition to the bowl shape, the keys are mounted at different depths to compensate for the lengths of your fingers. The middle finger keys are most deeply mounted. The keys only have to depress 2 mm to make and 4 mm to travel. This makes for a quicker more sensitive touch than keyboards you may be used to. It a little like the light touch of keypunch keypads of yore, though not as light. Your thumbs in an ordinary keyboard have nothing to do but hit the space bar. On this keyboard they are much busier. The left thumb hits oversize Backspace and Delete keys, as well as Ctrl, Alt, Home and End. The right thumb hits oversize Enter and Space, as well as Ctrl, Alt, PgUp and PgDn. Your baby fingers have much less to do on this keyboard. They don’t have to stretch to the far left or right. Those keys are moved to a new bottom row, as are the arrow keys. Everybody I have talked to who uses this keyboard, myself included, raves about it for comfort and speed. It is recommended for anyone with wrist problems. The keyboard is a quite different layout from standard and takes much more getting used to than other keyboards. Mine arrived 1999-11-19. After three days I was still all thumbs. After 5 days I was competent, but not as fast as I originally was. A month later I was quite competent with the alpha keys but still stumbled on arrows, / and \. After some months use of the keyboard I still had trouble with space and Enter, especially if I was tired. You hit these keys with the sides of your thumbs, which can be mildly painful, since you are hitting with the nail rather than the fleshy pad. The keyboard was very expensive and my keying was still slower than when I started. At that point I thought I had made a mistake. By 2000-09, I was still clumsy with the arrow keys, but completely at home with the rest of the keyboard. I had grown to love the keyboard. It is very quick and effortless, faster than any keyboard I have ever used. Even 19 months later, in 2001-06, I still found myself looking at the arrow keys to use them. They refused to kick in by reflex. By 2006-01, 6 years later they were on automatic, but I don’t remember when that happened. I am slower than most people at learning any sort of mechanical unconscious skill. It is hard for me to go on automatic. The keyboard comes with some simple typing tutor software to ease the transition. The main complaint I have with the keyboard is the lack of orientation bumps on the index finger keys. There are subtle tactile clues for home position. The keyboard is quite awkward to use one handed. It is hard to hit DSK Ctrl-C while the right hand holds the mouse. I have used the keyboard programmability to convert Ctrl-J to Ctrl-C and Ctrl-K to Ctrl-V. These are easier to hit with the left hand. This means I have lost Ctrl-J and Ctrl-K for other purposes. One feature I especially like is the optional noises the keyboard makes when you go into and out of CapsLock, ins or keypad mode. The errors I made in the adjustment period were reaching too far for keys and letting my fingers wander off home position. It is quite odd having all the keys in easy reach without stretching. I also tended to keep confusing Space and Enter which you key with your right thumb. I counted on eventually getting a performance boost comparable to flipping to DSK because you reduce all the stretching (and consequent errors) with the baby fingers, and eliminate that right hand leap back and forth to the arrow keypad as if you were playing Lizst on a traditional extended keyboard. That means extra productivity which should quickly pay for the keyboard. I am finally there. People on the Internet complain about the huge volume of work I post every day! They complain I dominate all the debates with sheer volume. You might want to consider this keyboard and using it in QWERTY even if you are not yet ready for a leap to full optimality. It comes with firmware in the keyboard to handle Superkey-like keystroke macros and custom remapping. Some models are advertised as DSK/QWERTY switchable either by keyboard [program]+[ctrl]+[f5] or software. You don’t need a model with DSK keycaps to use the DSK layout. Having DSK support in the keyboard hardware/firmware is preferable if you plan to use the keyboard in operating systems other than Windows or for tweaking the BIOS (Basic Input Output System) settings. I conversed with David Bialick of DMB Ergonomics via email. Before I bought my keyboard, he assured me the DSK/QWERTY switching is done in the keyboard firmware. It does not require any utility software, TSR (Terminate and Stay Resident) , or driver to flip modes. Further, he pointed out that if you load the keyboard with macros under Windows, you can unplug it and take it to another machine under another OS (Operating System) and it will still remember all its keystroke macros. Even the non-DSK keyboard I played with worked fine with DSK using the standard Windows DSK drivers. 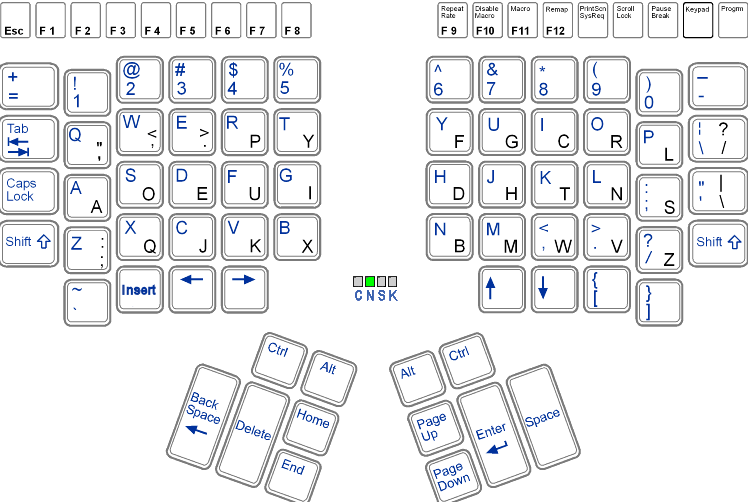 The DSK models have key caps have dual legends: QWERTY letters in the upper-left corner, Dvorak letters, slightly smaller in the lower-right corner. You toggle between QWERTY and DSK with [program]+[ctrl]+[f5]. This is useful if non-DSK hunt and peck typists sometimes use your keyboard. To turn the numlock indicator off , hit [keypad] then [7-Numlock] then [keypad]. [Progm]+[ctrl]+[Disable Macro/F10] Reset. Forget all remapping, programming and settings. If the keyboard starts acting weird, ignoring keystrokes etc., try a reset to cure it of the trauma. If it does not work, try the alternate control key. As my keyboard has aged and I have aged, more often when defining a macro I unintentionally reprogram some key. Sometimes the problem is easy to fix. I wrote a program called KeyPlayer that will show you what code your computer is receiving each time you hit a key. It can be useful in diagnosing problems. Sometimes repairing a problem creates even more problems. Eventually, I have to reset and program in all the macros from scratch. I can’t just reload the keyboard from the last good state. This is the thing I like least about the keyboard. The coming version is supposed to have this feature. I will buy a new one just for this. [Progm]+[ctrl]+[F5] Toggle QWERTY and Dvorak layouts. [keypad] Toggles right hand half of keyboard between normal and keypad modes. Don’t confuse this with [numlock] toggle. Normally off. If your keyboard goes nuts, usually it is because you accidentally hit [keypad]. [numlock] The 7 key. Toggles between numeric and arrow layout on the keypad. Only works in keypad mode. Don’t confuse this with the [keypad] toggle. Normally on . To turn the numlock indicator off , hit [keypad] then [7-Numlock] then [keypad]. [Progm]+[Repeat Rate/F9], then [F1] to [F12] Set keyboard Repeat Rate. [F12] is fastest. I use [F10]. [Progm]+[Progm Remap], then pairs of keys to remap then [Progm]+[Progm Remap] Remap the keyboard. Best understood with a simple experiment. You might use it for example to swap the positions of [\] and [/]. This is not as useful as you might think. If you move a key, all its modes must move with it e.g. keypad, NumLock, shift, ctrl, alt, left foot pedal, right foot pedal etc. In other words you can’t move the 7 key and the & key independently. [Progm]+[Progm Macro/F11], then the key for invoking the macro, then the keys defining the macro, then [Progm]+[Progm Macro/F11] Define a keystroke macro. You can later type a long string by hitting a single key, [ctrl]+key, [alt]+key, [ctrl]+[alt]+key or [shift]+[ctrl]+[alt]+key etc. I reserve [F11] and [F12] for useful macros. You can use the [Progm]+[Macro Data/F7] to pause the macro to let you enter data. When you run the macro, hit [Progm]+[Macro Data/F7] to resume the macro after you have entered your data. Use [Progm]+[Macro Delay/F8] to introduce a short pause. Left and right ctrl and alt keys combinations are programmed independently. So Left-Ctrl-C can do something different from Right-Ctrl-C.
[Progm]+[Progm Macro/F11], then the key for invoking the macro, then [Progm]+[Progm Macro/F11] Delete a keystroke macro. Return the key to its normal meaning. [Progm]+[Disable Macro/F10] Disable all keystroke macros. Toggles whether macros are active or not. You might want to turn them off to get at the original meaning of the keys without throwing out your macros. To disable a single macro, see the removal technique above. [Progm]+[right Ctrl]+[F6] Sticky Keys. Toggles whether the [right ctrl] key is sticky. Of interest to disabled people who can’t hold down the [ctrl] key and hit another key at the same time. Similarly other keys can be made sticky. [Progm]+[ctrl]+[F2] Configure your keyboard to hold up to 24 macros. As a side effect erases all macros. Each macro can be 56 characters long. It would be nice if it were considerably longer so you could insert boilerplate or template text or code. This is corrected in the Advantage 2. [Progm]+[ctrl]+[F3] Configure your keyboard to hold up to 36 macros. As a side effect erases all macros. Each macro can be 38 characters long. [Progm]+[ctrl]+[F4] Configure your keyboard to hold 48 macros. As a side effect erases all macros. Each macro can be 28 characters long. In this mode the keyboard may not be fast enough for fast typists since it has to check for all 48 possible macros on every keystroke. You can plug two optional Kinesis foot pedals (sometimes called foot switches) into a pigtail connector on the Kinesis keyboard. There are a variety of models. These are the ones I chose. I bought a pair in 2001-02. The left pedal acts as keypad Shift, which actives the embedded keypad layer until the foot pedal is released. The right pedal acts like a Shift key. You use the left pedal to invoke macros you have preprogrammed into each key, (optionally with any combination of Shift, Ctrl and Alt). The macros may be executed by the keyboard firmware itself or by macros in your editor. Keyboard firmware replay is slower, but works with any program, even ones that don’t have their own macro scheme. You have access to two layers of macro programming, with and without the left pedal pressed. Normally you would program your keyboard so with the pedal pressed you get keyboard macros and without pressing, you get the ordinary keystrokes. The left pedal gives you rapid access to a hundreds of unassigned macro key triggers. You can trigger dozens of these macros with one finger of your left hand especially useful when your right hand is busy with the mouse. The right pedal lets you type capital letters or shifted key functions without having to hit two keys simultaneously. Surprisingly, I found using the right foot pedal for shift came very naturally. It takes much less dexterity than hitting Shift with the baby finger of one hand and then the letter key you want capitalized with a finger of the other hand, then releasing Shift, all with split second timing. For long strings of capital letters, using the footpedal is much easier than fiddling with CapsLock. The only thing that gave me trouble is I kept hitting BackSpace and Enter with the right foot pedal depressed, which is not treated the same as unshifted BackSpace and Enter. Unfortunately, I can’t reprogram them to act like unshifted BackSpace and Enter without also affecting Shift+BackSpace and Shift+Enter on the keyboard. To program the foot pedal macro functions I found it simpler to pretend you don’t have any pedals. Program your macros using the Keypad and Shift buttons on the keyboard. (Hit Keypad to simulate hitting the left pedal and hit it again to simulate releasing it). Then play the macros with the foot pedals. Actually once you are past the part where you define the macro trigger, you can use the foot pedals normally without risk of reprogramming them. If you try to define them using the foot pedals, I found I kept accidentally changing the meaning of the pedal itself. You could do that intentionally. You could program either foot pedal to do something quite different than act as Keypad Shift and Shift, but then you would lose rapid access to the keypad layer of macros. Unfortunately, there is no software to help you program the keyboard under NT, W2K, XP, W2003, Vista, W2008, W7-32, W7-64, W8-32, W8-64, W2012, W10-32 and W10-64 or even to save/restore your macros. 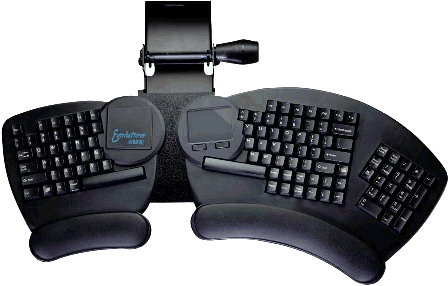 The Kinesis software only worked under Windows . It is no longer available. I suspect the problem is Windows is blocking low-level access to the keyboard out of security concerns. I suggested writing a DOS (Disk Operating System) version of the utility and distributing it on a DOS-bootable thumbdrive, but they did not reply. You have to program strictly with the keyboard firmware or by booting to Windows. Happily, the macros stick even when you turn off the power. The foot pedals have cables with contribute to the rat’s nest under my desk. I keep getting my feet tangled in them. I could never find a suitable way to fix the pedals in position. If they won’t stay put under your feet, they are useless. I have given up on them. Perhaps some day I will figure out some way to lock them in place I won’t kick loose with my feet. I have trouble finding them with my feet when I sit down, even with bare feet. (I have HIV-caused numbness called neuropathy that makes this especially difficult.) Oddly, the cords come out of the front i.e. (the small end) of the foot pedal wedges. I am not sure how you are supposed to orient them. The instructions give no clue. To use the footpedals, you have to sit up straight with both feet flat on the floor. This can be irritating at first if you are used to sloppy posture. The keyboard macros are quite a bit slower than ones programmed into your computer, for example in SlickC™ in the SlickEdit® editor. Further, computer created macros can be backed up where keyboard ones cannot. So the trick is to do most of the macro expansion work in the computer and just use your keyboard macro to trigger the impossible-to-key e.g. Shift-Ctrl-C computer macro name. Unfortunately you can’t use Left-Foot-Pedal-X as a macro name for the computer. You need an intermediate keyboard macro. So first you get your computer macros working, then you hook them up to keyboard macros, for one-key triggering. It sounds like a lot of work, but when you are done you will wonder how you even managed to get anything done without them. The advantage of a separate keypad is you can use them with your left hand while your right is occupied with the mouse. You can put them aside when you don’t need them freeing up disk space. There used to be a greater variety of keypads, some intended for auxiliary macros. With USB (Universal Serial Bus), keybads effectively act like a second keyboard, so you can mix and match keyboards and pads from different vendors. The Kinesis Freestyle 2 has 21 keys including a 0. The more expensive Low Force Tactile Numeric Keypad also has 21 keys, including a 0. The Freestyle works on the PC. The Low Force black works on the PC and the white on the Mac. The Mac version has a quite different layout. Even if you don’t buy a separate numeric pad, there is an embedded keypad superimposed on top of the right hand letter keys. You turn it on by hitting keypad or with a footswitch. It gets confusing. What is does after that depends on the current NumLock toggle. Most likely you will never use the numeric keypad function, except when you invoke it by mistake. If the numlock indicator is on, you can turn in off with Keypad 7 Keypad. If you want to use the embedded numeric keypad, first click keypad. That will turn the keypad indicator on. Then hit 7. That will turn the NumLk indicator on. They you can hit the G C R, H T N, M W V keys to get 7 8 9, 4 5 6, 1 2 3. But where is 0? You hit the space key to get 0.
once all the border, FedEx and tax people got there shares. I later learned there is a Canadian distributor. It is almost impossible to use the arrow keys one-handed since the left/right arrows are on the left side of the keyboard and the up/down arrows are on the right. I often have my right hand occupied with the mouse as I try to augment navigation in a document with the left hand on the keyboard. Perhaps a separate numeric keypad in arrow mode would be useful. Perhaps genetic engineering could give me a third arm for the mouse. Perhaps I could use the embedded keypad arrows with just my right hand and mouse with the left. The solution I came up with is to use a the left footswitch to turn on keypad mode when I am using the mouse with my right hand. Then I have macros coded for the left hand for all the usual mousing functions e.g. cut, paste, copy, arrows, del. I can trigger them with a single key single key, e.g. O = cut, E = copy, U = paste. I don’t even need to hit Ctrl at the same time! The foot pedals don’t work reliably. The soft wrist pads wear out and get scruffy looking. Replacements are expensive. If you replace with Dr. Scholls moleskin, the pads are only a few cents, but if they are not as large as the originals, it is unsightly since the glue on the bottom of the official pads melts the plastic and the keyboard surface looks unsightly if not covered. The function keys are all identical, on the small side, with mushy feel, disgustingly poor quality and are arrayed in a perfectly straight row, giving few tactile clues that you have hit the right key. I keep hitting F4 (close) when I mean to hit F3 (search next). There is a special function key called keypad which toggles the right hand part of the keyboard into a numeric keypad. I hit this by mistake periodically. The effect can be utterly baffling until you are used to it. There is an indicator light in the middle of the keyboard to warn you when you put it into keypad mode. I also sometimes hit the [Progm remap] key when I intend to hit [Progm macro/f11]. If I don’t notice immediately, I soon remap the keyboard into utter gibberish. I usually then give up and clear the keyboard completely with [Progm]+[ctrl]+[DisableMacro]. Happily, hitting the Progm remap] key by accident does nothing, only when you hold down [Progm] first. I also find that when I get typing really quickly the keyboard (or more likely Win2K) fails to notice shift-release and thinks the shift or control key is still pressed when it has been released. I can clear the problem by tapping each of the shift, ctrl and alt keys in turn. However, it is nuisance and breaks my train of thought. Perhaps a future design of the keyboard could buffer keystrokes more fully and spoon feed them to the CPU (Central Processing Unit) slowly enough that it would be unlikely to lose the upstroke. Perhaps the size of the buffer in the keyboard needs to be increased. It appears to be less of a problem in W2K than NT. While macros in the keyboard are nice, they are no substitute for having them also in the computer. Why? Computer macros can be more intelligent. They can do conditional logic, or pay attention to context. They can offer dialog boxes to fill in variable information. On the other hand, computer macros are more complicated to set up. It is fairly easy to inadvertently program macros or key remaps without noticing. The keyboard then behaves strangely. To help track down what is going run the KeyPlayer app. It will tell you what keystrokes are being generated when you hit each key. You can then figure out what has gone wrong and you can fix it with clearing all macros and remaps. Eventually you should be able to control this with software, so it will be easier to see what you are doing. You can use copy/paste to set up computer macros. You have to type every keystroke to set up keyboard macros. If you make a mistake setting up a computer macro, you can correct it. IF you make a mistake setting up a keyboard macro, you have to start over from scratch. Computer macros can include mouse menu clicks. Keystroke macros just replay keystrokes. The undo key will be clever with computer macros and will undo a whole command’s effects in one click. You must undo the effect of a keystroke macro character by character. You can back up your computer macros. There is no keyboard macro backup software for NT, only Windows. The idea combination is to have macros both in the keyboard and computer software. There is no W2K software to save and restore the keystroke macros. The keyboard forgets everything I’ve ever taught it every month or so. Kinesis won’t tell me the tech specs to roll my own. Though the Evolution looks pretty space age, I think the dish shaped keyboard I have is even better. The advantage2 is the more expensive replacement for the advantage. It handles 100 macros of 200 characters each. The function keys have a proper Cherry feel. You can download macros and layouts as ASCII (American Standard Code for Information Interchange) files. If the keyboard stops working, Turn the keyboard upside down and shake out crumbs. Then clean with canned air. Remove the six screws on the bottom and clean inside with canned air and wipe out any dirt with a Kleenex soaked in isopropanol. If that does not work, do a full cleaning where you pop the keys. Write down your macros. If you lose them, it will be much quicker to get back to where you were. Kinesis is working on a new model where you can save/restore them to a file. If the wrist pads wear out, check out various pads for feet at the local drugstore. Use a DYMO label maker to label the indicator lights C N S K which is more meaningful than the legends imprinted at the factory. You could save some money by buying a QWERTY keyboard then concocting a DSK keyboard driver for it with Microsoft Keyboard Layout Creator. The disadvantage is your keyboard will revert to QWERTY during boot. Improve the feel of the function keys. They used to be quite spongy. They are now Cherry ML (low profile). Make it possible to download and upload the keyboard programming to a file that could be backed up. You can now edit the programming as text files. They have done what I requested plus quite a bit more. They have come out with five new models. KB600 Advantage2 PC & Mac: Cherry MX brown switches. KB600LF Advantage2 LF PC & Mac: Cherry MX red switches (not clicky). KB600QD Advantage2 QD PC & Mac: dual legends DSK and Qwerty. Cherry MX brown switches. KB605 Advantage2 silver PC & Mac: silver case. Cherry MX brown switches. Extra cost. KB620-GR Advantage2 Graphite PC & Mac: brushed aluminum look case. Cherry MX brown switches. Extra cost. All of the Advantage2 keyboards can do both QWERTY and DSK, but only the KB600QD has dual keycaps. Cherry MX Brown Tactile Low-Force Key Switch, QWERTY keycaps, PC or Mac, SmartSetTM Programming Technology, can download/upload keyboard programming. Cherry ML function keys. Supports 100 macros of 200+ characters. Can be configured for the Dvorak layout, but does not come with dual DSK/QWERTY keycaps. The function keys have proper Cherry switches, but they are smaller than regular keys. specs. Cherry MX Brown Tactile Low-Force Key Switch, QWERTY/DNSK keycaps, PC or Mac, SmartSetTM Programming Technology, can download/upload keyboard programming. Cherry ML function keys. Supports 100 macros of 200+ characters. The function keys have proper Cherry switches, but they are smaller than regular keys. All your custom layouts are saved and stored as *.txt files directly to the keyboard. These files can be opened with any text editing program, on any operating system. specs.
. DMB no longer carries Kinesis products. 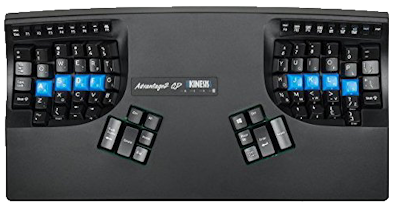 You can also get a Kinesis keyboard from any of the distributors in this list.
. You will find QWERTY models for sale commonly but rarely QWERTY/DSK. You might buy an old one to see how you like it and if you do, spring for a new one and resell your old one, probably for the same price as you bought it. 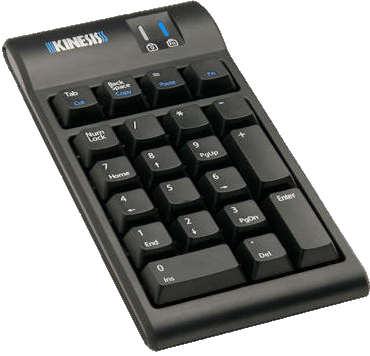 Kinesis keyboards are sometimes provided to disabled people at reduced cost by government agencies. They help with back strain, wrist strain and other movement disabilities.